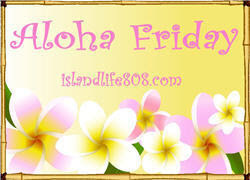 Liza's Eyeview: Aloha Friday: Financial Tip? In Hawaii, Aloha Friday is the day that we take it easy and look forward to the weekend. So Kalani thought that on Fridays she would take it easy on posting, too. On her blog she’ll ask a simple question for us to answer. Nothing that requires a lengthy response. Then if we would like to participate, we can do the same. For more Aloha Friday Posts, visit Kalani at Island Life. Online banking/online bill payment...save $ on stamps (they all add up)! Use only cash. This way, you spend only what you have on hand. Pay your bills FIRST! This was a hard one for my hunny to understand. This way, you avoid the added cost of late fees. We've been careful to eat in instead of out. Making lunches for my husband to take to work adds up to big savings over the month. Just think, at $8/day, 5 days/week for 4weeks = $160! Use coupons and comparison shop using ads from the Sunday paper. If you have a CVS near you definitely take advantage of their amazing ECB deals. Have a great weekend and good luck! Pay your mortgage first and then pay cash for everything. One more thing. Before we pay anything or anyone, even the mortgage, we pay our tithing at our church. Hmmm. The best financial advice I could give someone would be to either go through Dave Ramsey's Financial Peace University or to go through Crown Financial Ministries. Definitely snowball your debt. Pay off the small debts as fast as you can and then add that money to larger debt payments. Don't buy anything unless you have the money and save for a rainy day. Last year we had to have work done on the siding of our house, my husband broke his leg and we had to put on a new roof. We scraped the bottom of our account, but we paid cash for everything. Instead of buying new things for everything, teach your kids to be creative with what is around.